As of February 2018, the DBR1 Replicar is officially out of production. Order the iconic right hand drive MEV Replicar today! 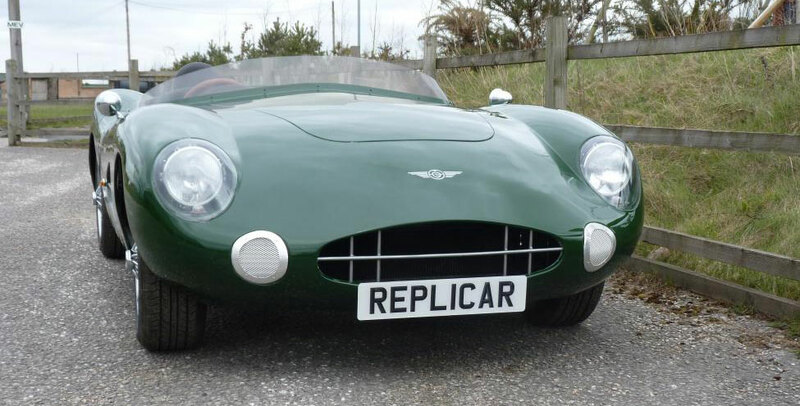 To order your MEV Replicar, inspired by the Aston Martin DBR1, please fill out the form below and click the submit button. Each MEV Replicar comes with a Manufacturer's Certificate of Origin from Exomotive. This document records the manufacturer and ownership of the chassis. It is very important that the information recorded on the Certificate of Origin is correct and accurate, as it will be used when titling the vehicle for road use in your state. Please enter the information exactly as you want it to appear on your COO. Each MEV Replicar is custom-built by MEV in the UK and imported by Exomotive. A sea-rated shipping crate or container is required due to the large size. The configuration and options for the MEV Replicar evolve over time through our commitment to continuous improvement. Exomotive reserves the right to make updates to the kit and it's configuration which may affect my order and I agree to accept those changes. I understand that Exomotive will make every attempt to have my MEV Replicar kit ready at the estimated production date. In the rare case that my kit is not ready on time, Exomotive may change production dates as needed, and I agree to accept those changes. Wire Transfer: Contact us for details. If you have any questions, please call us at 404-919-1396 or email info@exomotive.com. We look forward to fulfilling your order!